Join dinosaurs Rex & Trixie for towering thrills as you zip back-and-forth on an exhilarating adventure in Disney·Pixar Toy Story Land. The facility is undergoing scheduled maintenance and closed to guests. We apologize for any inconvenience and wish you have a magical day experiencing our many other attractions and entertainment offerings at Shanghai Disney Resort! Rex has got his tiny claws on RC Racer’s remote control—and he’s ready to take you on one wild ride! When Andy’s away, the toys will play. 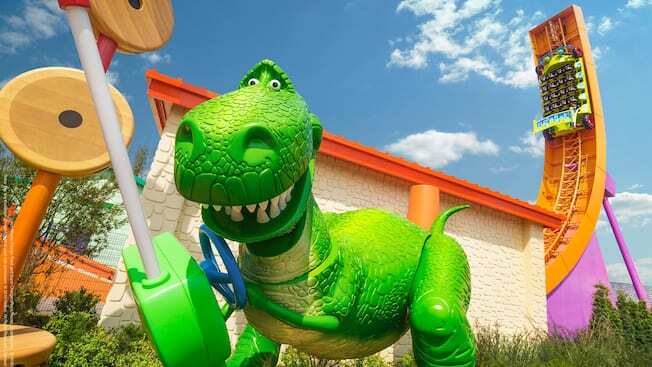 Luckily, he set up his orange Hot Wheels set in his backyard just before he left… and no one loves playing with it more than Rex, the insecure Tyrannosaurus Rex from the Toy Story films. With the help of his Triceratops friend Trixie, Rex is inviting Guests like you to race day! After winding your way through a series of toy garages and race-pit buildings, find yourself a seat inside RC. Then, hold on tight as RC begins zooming forward and backward, seemingly breaking the laws of gravity while taking you higher and higher on the U-shaped track. Rest assured, Rex’s Racer is the most visible attraction in Disney·Pixar Toy Story Land—with a towering half-pipe that can be seen from nearly anywhere you stand. Don’t miss your chance to cross the finish line! Beginning April 26, 2018 at 1:00 PM, a day full day of laughter and fun awaits in Disney·Pixar Toy Story Land, a larger-than-life new addition to Shanghai Disneyland. Set in the midst of Andy’s backyard, it’s a place where Sheriff Woody, Buzz Lightyear, Jessie the yodeling cowgirl and so many of your favorite Toy Story pals have come to life… and are ready to play! Head over to Woody’s Roundup for a square dance party! Climb into a cart and let your pony swing you to-and-fro during a hoof-tappin’ hoedown.